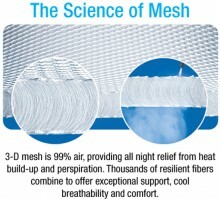 Cool mesh material creates a virtual layer of air between the face and pillow, allowing air to circulate so skin can breathe. The pillow’s base layer is made of plush, conforming memory foam for the ultimate in comfort and support. The pillow comes with an outer bamboo cover, which feels ultra soft against the skin, enhancing the overall feel of this luxurious sleeping surface. 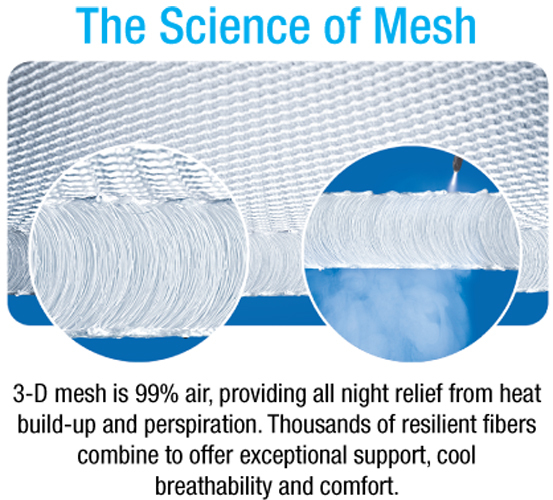 The cooling properties of 3-D mesh technology combine with plush memory foam to provide an incredible new bed pillow for your head, neck and shoulder area. Enjoy the plush feel of premium grade memory foam while sleeping on a virtual layer of air! This pillow keeps you cool and dry, while molding to fit the exact shape of your head and neck, ensuring proper sleeping posture posture throughout the night. Finally, a memory foam pillow that stays cool all night long! Click the button below to add the Cool Mesh Pillow to your wish list.